Brian Marsh, the „pioneering hunter“, who later became a writer, died on 10th November in Capetown at the age of 86. Born as Ewart Pinker in 1928 in South Africa, he took his step-father’s name when he was 6 and remained Brian Marsh for all his life. Pioneering he really was. 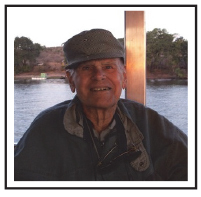 In the 1950s he started as one of the first professional crocodile hunters in Nyasaland, at what is now Lake Malawi. From that time into the mid-eighties the fisheries dept. issued unlimited crocodile licences. An able hunter like Brian could make a good living from selling the skins. While hunting in Nyasaland he became a friend of “Pondoro” Taylor and later greatly facilitated Peter Capstick‘s biography of John Taylor, the “Man called Lion”. At that time John Taylor still lived with his partner Aly Ndemanga near Lake Malawi, and Brian often came to visit them. As a staff contributor to Magnum Magazine from 1987, when his days as a professional hunter in various countries of Southern Africa were over, he was a well-known figure in the hunting community. But his writing career really took off in 1982 with a novel, titled “The last Trophy”. Although the book had two reprints, he then settled for the non-fiction articles and books we know him for, drawing on his vast experience of hunting in Africa and the people he met over the decades. To many of us he is best known from his biographical books: “Baron in Africa”, the authorized life story of the owner of Safarilandia in Mozambique, Werner von Alvensleben; “The Hunting Blackbeards of Botswana”; “A Pioneering Hunter”, a fitting title for his autobiography. After his wife of almost 50 years, Jilly, passed away, his life became more difficult. His last years he spent in an old age home in Pinelands, where he was supported by a number of friends, mostly hunters from all over the world. When I visited him in 2012 to talk to a fellow crocodile hunter from Malawi, one could see that his age told against him. Nevertheless, he would always remain a gentle host to his visitors.